You may or may not have noticed that birth photography is now listed as a service offered on my pricing and FAQ pages that hasn't been there before. And if you are one of the many people have not heard of hiring a professional photographer to document the labor, delivery, and moments immediately after birth, your mind may be swimming. Thinking how completely awesome it would be to have those photos. Or you may be totally grossed out at the mere thought. But before you jump to negative conclusions and click away from this blog post, give me a chance to open your eyes. Birth is amazing. Amazing. There is no other word that can describe it. Two times I have been the woman bringing a new life into the world and have also held the hand of my sister as she labored and gave birth to both of my nephews. And photographed many other strong women birthing their bubs. Amazing. The thing about birth is that you forget it. You remember it because your life was forever changed, but the small details? Nope. Maybe one or two mental snapshots or memories hold over the years. Or maybe you only remember because you've repeated them over and over so many times to family and friends. Now imagine having a box of prints or an album containing all of those story-telling details. The moments of weakness. And the moments of absolute raw strength and empowerment. The look on your face the moment you first look at the baby you've become so attached to as it grew inside you. Remembering. Always. The point of this post is this: I can talk about the value of photographing your birth until I'm blue in the face. Or I can put my money where my mouth is and SHOW you. 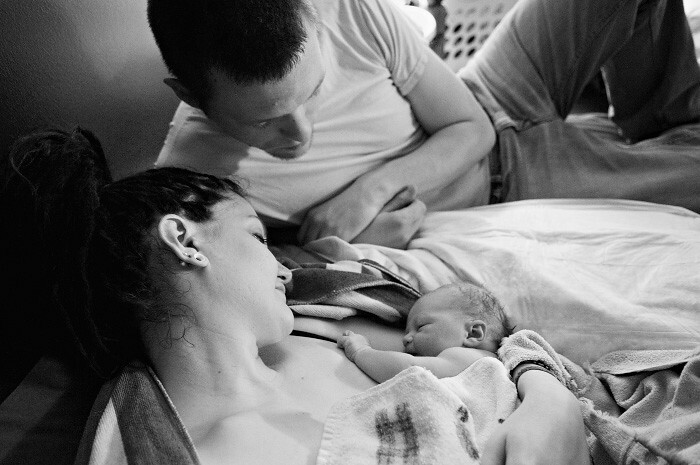 Show you that birth photography isn't about being spread eagle with the baby crowning. Show you the raw and uncontrollable emotion that cannot be hidden from a mother's face when she first looks at the human born from her womb. So that is what I'm going to do. Jaclyn Michele is going to put herself out there because really, how can I not when I am asking you to trust me with such important moments in your life? So, here they are. Some of the photos from the birth of my daughter this past February in our home. There you have it. Me at one of my most vulnerable and most powerful moments. And here's the thing - I wish I had more photos. Photos of my midwife supporting me through contractions. Photos of the precious moments afterward. The midwives weighing and measuring her, Lucas coming into the room because Mama woke him in the middle of the night with her labor vocalizations. Checking out and meeting his little sister for the first time. But I don't have those photos because our plans to have a professional photographer come out to document those moments didn't come together like we'd planned and the photo-taking was left in the hands of my sister, Adelaide's father, and midwife when they had a spare moment. Can I guarantee I will make it to your birth? Of course not - child birth is completely unpredictable! But I will do everything in my power to be there and to be documenting those moments for you so you can enjoy your precious new baby or babies and not worry about who has their cell phone handy to snap a few photos. At a hospital, birth center, or in your home, if you are even remotely interested in having me photograph your birth, contact me and let me know. We'll grab tea or coffee and chat! My sister had her birth photographed, and I cried when I saw them in her gallery. I mean, I just bawled. The details captured, the power of the emotion captured. I was so thankful she captured it. These were lovely, Jaclyn. I wish I lived in your town, cause I would surely hire you if I were preggers. Wooo-hoooo!! Jaclyn, to be honest, I don't read you blog very often, but today I did and I'm so glad!!! Congratulations on a beautiful homebirth and on venturing into birth photography!! I too have had my children at home and I do birth photography as well. It's so exciting to find other birth photographers because I know that means more people are being given those memories, those images of those precious moments to cherish forever. I had a photographer at my last birth and the images are so engrained in my brain and I love looking at them and reliving the birth. I love having them. I love capturing those moments for other mamas. I love birth. Congratulations and thank you so much for sharing!